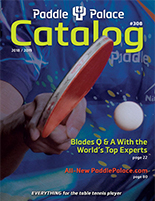 Learn table tennis tactics from USATT Certified National Coach and Hall of Famer Larry Hodges. Includes tactics against different styles, grips, and surfaces as well as tactical and strategic thinking. The book opens with this: "Tactics isn't about finding complex strategies to defeat an opponent. Tactics is about sifting through all the zillions of possible tactics and finding a few simple ones that work." The book then explores the tactical and strategic development needed to have the specific tactical tools needed in any given match - your "tactical toolbox."